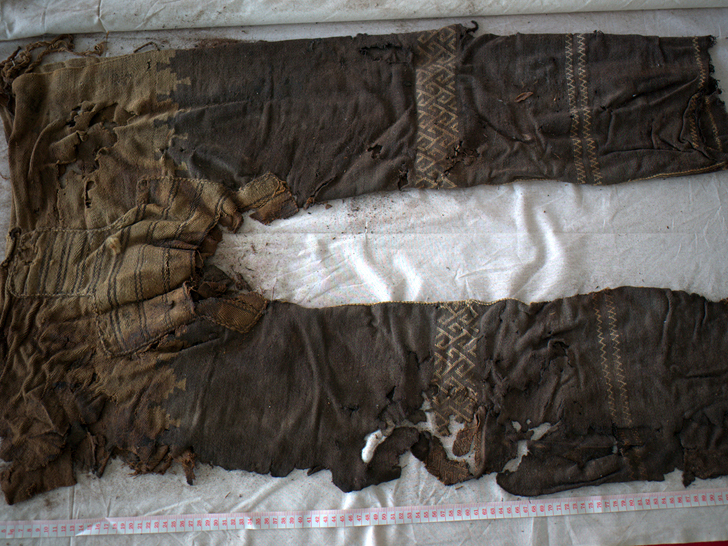 The excavated remains of two trouser-clad men from the primeval Yanghai tombs in western China suggests that ancient nomadic herders put their pants on just like the rest of us: one leg at a time. Dated to between 3,300 and 3,000 years ago, or somewhere around the 13th and 10th centuries B.C., the woolen pants are the oldest-known examples of the garment, according to Ulrike Beck and Mayke Wagner of the German Archaeological Institute. Despite their age, the bygone breeches share an uncanny resemblance to modern riding pants, with straight-fitting legs; a wide, reinforced crotch; and patterned bands for adornment. Together with the horse-riding gear and weapons found in the graves, the find supports the notion that mobile pastoralists in Central Asia invented bifurcated lower-body coverings to replace loincloths, togas, and tunics at the dawn of a new age of mounted warfare, write Beck and Wagner in the May 22 issue of Quaternary International, which published their report. PHOTOS | 5,500-Year-Old Leather “Sneaker” Discovered in Armenia—World’s Oldest? Unlike contemporary tailors, who create their garments by cutting from large swathes of fabric, ancient weavers loomed their trousers in precisely sized sections. Shaped to fit their wearer, bespoke-style, each garment featured side slits, strings at the waist for fastening, and decorative elements. The yarns for the finished pants and the threads used in the final sewing also matched in color and quality, implying that the weaver and the tailor was the same person or that they cooperated in a “highly coordinated way,” the archaeologists add. PHOTOS | World’s Oldest Purse Unearthed—And It’s Studded With Dog Teeth! No word on where wedgies come into that.